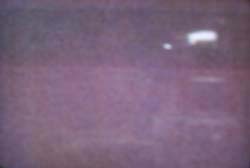 There has been some form of night vision around since the sniper scopes of World War II. These were cumbersome, devices with short battery lives, and indifferent performance. 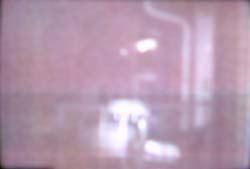 They required the use of Infrared lighting as they were not really much more sensitive to light than the human eye, some models being even less sensitive than the unaided eye, but infrared light was visible to them. There was some progress made over the decades, but these devices were not really brought down to civilian levels of cost, and up to civilian levels of user friendliness until the last decade or so. The catalyst for much of this was the dissolution of the old Soviet Union. The influx of cheap, relatively inexpensive Soviet military surplus units sparked a small, but growing market. The first unit I ever used was a small, 1st generation (actually 0 generation) device purchased at a gun show, back in the early nineties. This had a pistol grip, and looked something like an old style movie camera. I will not go into extreme detail on the qualities, features, capabilities, and history of night vision devices (NVD), but will refer interested parties to a couple of links in my gunlinks section. Using a search engine, you might want to spare yourself the trouble of sifting through tens of thousands of hits by entering NVD, or night vision. This should provide more information than you could possibly want. The best general information sights for the uninitiated are those of ITT, Litton, and the U.S. Army. The basic classes of NVD are Generation 0 (sometimes erroneously referred to as Gen I), which are strictly I.R. devices, and have little, if any, increase in sensitivity over an adapted human eye. Then there are the true generation I devices, which are often advertised as generation I+. These are a vast improvement over the 0 generation devices, but can not really be used in deep darkness without I.R. illumination. The newer, generation II devices use microchannel plates instead of cascaded tubes, and may be recognized by the distinct hexagonal, or square, pattern sometimes visible in the image. The latest, third generation devices have an increased tube life, and somewhat improved image quality over the second generation units. Units of all four generations are sensitive to I.R. light, and may be used in complete darkness with I,R, supplementation. There is a fourth generation of NVD in use by the military. As far as I know, no units of this type have made it on to the civilian market. The Army calls this new clip on NVD the anvids, and it is a significant improvement upon even the well regarded third generation units. I presently own recently made, generation I, and generation II night viewers, and one second generation night vision rifle scope. 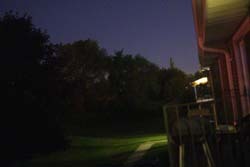 There is also my Sony Nightshot camcorder, which is sensitive to infrared. The night viewer is a Moonlight Safari model, and is not a bad first unit for the beginner who is curious about night vision but may not want to spend a fortune on what amounts to a new toy. I paid about $130 for mine on an ebay auction, and I see them regularly selling for around $200. The cheapest scopes are the NZT-100 types which I see selling for around $60-$100 depending upon the source, and the condition, but these are actually GEN 0 scopes, and will be of little use without a (not included) I.R. illuminator. My little scope has an attached Infrared illuminator, as it is really not sensitive enough to be a true starlight scope. This scope has slightly better night vision than I do when my eyes are completely acclimated after about an hour or so in deep darkness. As a photographer, I would say that this scope has a sensitivity of about 2 f-stops better than my eyes. Of course, this is without the use of the I.R. light source attached. With the I.R. source on, the scope is exceptionally bright, and will be able to view objects at a considerable distance. The I.R. source needs a couple of lithium batteries, but the scope itself is powered by a squeeze action, and no batteries or outside power source is required. The squeeze lever does not operate a generator, but applies pressure to a crystal element similar to those piezo crystals used in some of the fancier cigarette lighters. This high voltage spark charges the tube, which will stay bright until the charge runs down, at which time you must squeeze again. The amount of time the tube holds it's charge depends upon how bright the scene being viewed is. In a scene with a fair amount of light, or with the I.R. illuminator on, the tube will hold it's charge for a minute or so. Viewing a dimly lit scene, the charge could last for several minutes. The included chart gives a sort of a rough guide to what the performance of a given generation of night scope might be. This guide indicates the performance without the use of an I.R. source, and you will note that the first generation scopes are not listed. I will look for a better chart, but in the meantime, the sensitivity of a first generation scope is far behind that of the second generation, and in the areas of resolution, and distortion, the performance of the first generation lags far behind that of the second and third. I hope to eventually assemble a complete system of night vision devices including a pair of night vision binoculars, or goggles. The goggles might be preferable to the binoculars, if I could find a good set of second or third generation units. This is because it is possible to set the focus on goggles, and on a good set of standard binoculars so that the two units may be used together. this would seem to be a near ideal solution, since most NVD binoculars are limited to 2.5x or at the most 4x power. Standard binoculars do not have these limitations, and can have extra features like compasses (not the lighted ones please), rangefinders, and zoom optics. The same operational expedient would not apply to a standard rifle scope for a couple of reasons. First and foremost would be the awkward stance required to hold the head up to the scope while wearing something that sticks out of the face 4" or so. There is also the matter of eye relief, which does not really exist in binoculars, but is a component of all weapon scopes. It would be interesting and amusing observing the attempts made by a shooter to position rifle, scope goggle, and head correctly, while compensating for the combined eye relief of the scope, and near focus of goggles, all while trying to take aim and place a bullet on a target. Along with these military and sporting devices, there are also night vision camcorders. These are not really that sensitive, being a bit inferior even to the Gen 0 devices, but they can see I.R. light, and are quite effective with an illuminator of sufficient power. I have taken a couple of photos through my gen I NVD, using my little digital camera. The quality is not the best, but should give some idea of what a view through a fair quality NVD will look like. I basically held the NVD in one hand, the camera in the other, focusing and tripping the shutter with my third, or at any rate that would have been the easiest way had I actually possessed a third hand. As it was, the photo quality suffered quite a bit, but I did manage to get everything lined up good enough a couple of times so that some sort of image could be recorded. Clearly visible is the distortion towards the edges, which is a characteristic of Generation I devices. This distortion is exaggerated somewhat by my goofy shooting techniques, but is present and noticeable while viewing. The scene shows up quite well, and quite bright, as can be seen in the photos. An indication of how much the image brightness has been enhanced may be inferred from the windows in the first scene. The windows look into the interior of a very dimly lit bar across from where I live, and yet light seems to be pouring forth from them. The street scene itself was quite dimly lit. I plan to add to this section, and maybe start a page of night photos taken on my usual assortment of summer camping and boating trips. 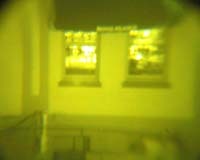 Incidentally, the green color of the majority of night vision tubes was not chosen at random.  Studies were done, which determined that the night adapted eye is most sensitive in the green color range. System sensitivities vary, as do imager sensitivities; the two are not the same. A genII or genIII unit with an imager capable of amplifying light 35,000 times may be the heart of a system with a total amplification of 1400 to 2000. The average system gain of a genI unit is 90 to 100, even though rated tube sensitivity might be rated at thousands of times. the total system gain is a function of the lenses, used, the tube used, and the efficiency of the design. if total system gain is not given, it is generally a good rule of thumb to take the sensitivity of the imager unit, and divide it by ten. Rifle scopes, and binoculars, in particular, reduce system efficiency because of the need to magnify the image. This is made even worse by the use of catadioptric lens systems, as are featured on most night vision rifle scopes. Performance table These comparison shots were taken out in the country on a couple of different nights, to show how the units perform under different conditions. Attempting to compare these units in the city is pointless, as the photos above should demonstrate. City comparisons also fail to highlight the advantages of the second generation scopes, since their increased sensitivity becomes more of a factor, as light levels decrease. Generation 0 units are not listed, though the Sony Nightshot camera could be used as an approximation. There are not yet any examples from a gen 3, but they are forthcoming. Generation 2 units overlap gen 3 units considerably, and it is possible for some of the better gen 2 units to outperform gen 3 units. A time exposure, night photograph, shown to the right, was taken off of my balcony at f 1.8, and 8 seconds, as a reference shot for the comparison photos below. The photos taken below were of the same scene, and were only taken a few minutes apart. All were taken at a shutter speed of 1/15 of a second. The Gen 2 unit is noticably brighter, but what is more important, it has much higher resolution, and better contrast. These were taken out in the country, where it was considerably darker than in the two city shots above. California Penal code, section 468. Any person who knowingly buys, sells, receives, disposes of, conceals, or has in his possession a sniperscope shall be guilty of a misdemeanor, punishable by a fine not to exceed one thousand dollars ($1,000) or by imprisonment in the county jail for not more than one year, or by both such fine and imprisonment. 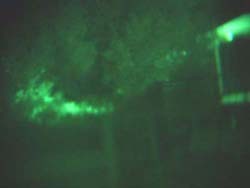 As used in this section, sniperscope means any attachment, device or similar contrivance designed for or adaptable to use on a firearm which, through the use of a projected infrared light source and electronic telescope, enables the operator thereof to visually determine and locate the presence of objects during the nighttime. This section shall not prohibit the authorized use or possession of such sniperscope by a member of the armed forces of the United States or by police officers, peace officers, or law enforcement officers authorized by the properly constituted authorities for the enforcement of law or ordinances; nor shall this section prohibit the use or possession of such sniperscope when used solely for scientific research or educational purposes.